Google Brings No CAPTCHA reCAPTCHA. No More Unrecognizable Phrases! If you have been on the internet even for a very short period of time, you will know it. When you are registering or commenting on a site, you often get those anti-bot phrases that you need to recognize. And, Most of them are so bad that even human’s struggle to identify them. I cringe when I look at those complex, distorted and ungainly text and numerical phrases. Thankfully, this may be soon the thing of past. Google has introduced a completely new and re-imagine bot figher – The No CAPTCHA reCAPTCHA. As the name suggests, Google has now changed, how a real human will let know the site that they are not a bot – They do it in most natural way possible, simply by asking! Google in an official announcement has said that they have begun rolling out a new API that radically simplifies the reCAPTCHA experience. A user just needs to do a single click on the check box confirming that they are not a robot! Why the need to reimagine CAPTCHA? Did you know that today’s Artificial Intelligence technology can solve even the most difficult variant of distorted text at 99.8% accuracy. Thus distorted text, on its own, is no longer a dependable test. This also means that those distorted text may recognized by robots better than even humans. So, Google has gone ahead and changed the entire process in the way robot identification takes place. 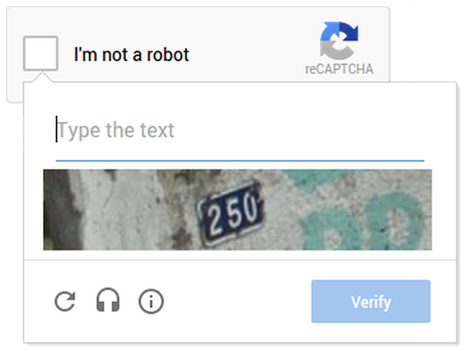 Google says, they have developed an Advanced Risk Analysis backend for reCAPTCHA that actively considers a user’s entire engagement with the CAPTCHA—before, during, and after—to determine whether that user is a human. This enables them to rely less on typing distorted text and, in turn, offer a better experience for users. However, the distorted text and number method may not go off completely as of now. If their advanced risk analysis algorithm finds some suspect engagement parameters, the user will still be asked to type distorted text and numbers after the click. Something like this may be shown to the user. According to Google, about 20 to 40 percent of actual humans may need to go through 2 step verification. But think about those 60 to 80 percent real humans who will not have to type those distorted text anymore. It will be so easy! Nice move. It would surely help users like us because It is seriously difficult to recognize the words from distorted captchas .